In this review of Disney’s Polynesian Village Resort, we combine reviews of both Disney’s Polynesian Resort with the Disney Vacation Club property known as Disney’s Polynesian Villas and Bungalows. Two Scoops Travel gives us her perspective on the Polynesian resort and Moment Mom shares her recent experience at the Polynesian DVC Villas. The ‘Poly’, as it is lovingly referred to, is considered a Disney Deluxe Resort. Opened in 1971, the Polynesian has earned a AAA 4 Diamond rating and maintains a solid 4.0 from TripAdvisor. One of the main benefits to staying at the Disney’s Polynesian Resort is it’s proximity to Magic Kingdom Park. Serviced by the iconic monorail and boat ferries, you can easily be in the park within 20 minutes. The monorail departs from the main lobby located in the Grand Ceremonial House. This tropically-themed resort sprawls across 39 acres of lushly planted lake-front property. Depending on your room, it can be quite a walk to the main lobby, so be sure to allow ample travel time. Of its 847 rooms, 360 suites are reserved for Disney’s timeshare members(DVC). Prices can vary greatly, but plan on spending a minimum of $500 per night. 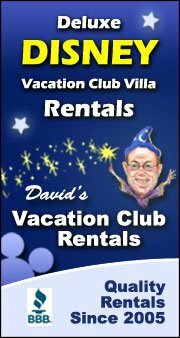 You can save some serious change by renting DVC timeshare points from a third-party retailer like David’s Vacation Rentals -and get a studio room that sleeps 5. Each room type offers upgrades for view, from the standard garden view, to a lake view and finally, the piece de resistance – a Theme Park view. Moment Mom’s family recently stayed in a Polynesian DVC Studio by renting points from David’s DVC Rentals. They had a great experience. Here is her close up look at the Polynesian DVC Studio. 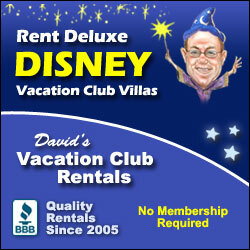 The Deluxe Studio rooms are the most spacious of all the Disney Vacation Club Resort Studios. They can sleep up to 5 people in one queen bed, one queen sleeper sofa, and one pull-down twin size bed. During our stay, we used all of these option and found the room very comfortable. The best part of the Deluxe Studio are the two bathrooms! This was our favorite amenity by far. One bathroom had a full tub/shower, sink and toilet. The other had a sink and wonderful walk-in shower with a rain shower head and a handheld shower head as well. Having two areas to get ready in the morning was a lifesaver with two kids! Other in-room amenities included a kitchenette, pack-and-play, large closet, and a table with two chairs. Each room also had a balcony which we loved spending time on in the afternoons. We have to mention, though, a less-than-ideal side effect of the fantastic location of the DVC rooms in Moorea. While they offer walk-to access to the Transportation and a Ticket Center, and Theme-Park views, unfortunately they also come with non-stop TTC’s ferry horn blowing. Not always an issue, but we struggled with trying to drown out the constant horn-blowing, which can last into the wee morning hours on those Magic Kingdom extra magic-hour-nights. If you’re staying in Moorea and a light sleeper, bring ear plugs. Both of our bloggers offer a great perspective on the amenities at Disney’s Polynesian Resort and Villas. Two Scoops Travel offers this glowing review of the Polynesian Resort Restaurants. In our opinion, this is really where the Polynesian shines. The Poly offers it’s guests not one, but 10 culinary options. We have in our group carnivores, omnivores, a vegetarian and a gluten-free tween. As with all DIsney dining, each person receives individualized attention from the staff and chef who guarantee they each enjoy the dining experience. If you have a food allergy, relax! Ohana: $$, DDP 1 Table Service Credit. Located on the second floor of the main Ceremonial House, Ohana is a family favorite. 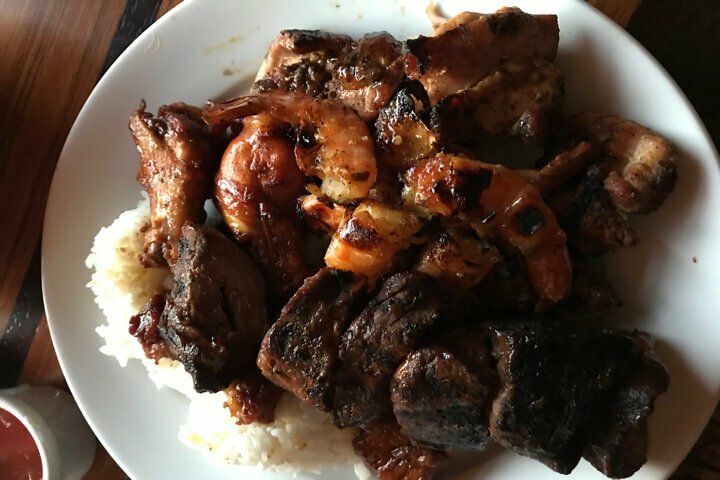 Dinner is served family-style with all-you-care-to-eat offerings of grilled steak, chicken and shrimp. It’s a great value for the price, I guarantee you will not leave hungry. Breakfast is one of our favorite Disney experiences, combining amazing food with a visit by Mickey, Pluto, Lilo and Stitch! Nestled between Kona Island and Ohana’s is this delightful little restaurant. Serving up island-Asian cuisine, Kona Cafe will not disappoint. Try the Tonga toast for breakfast, it’s famous! This tiny, but mighty, bar area adjacent to Kona Cafe presents freshly prepared sushi beginning at lunch time. In the morning it transforms to a yummy island coffee bar with a selection of island pastries and the rich and delicious Kona coffee. Spirit of Aloha Dinner Show: $$$$ DDP 2 Table Service Credits. Disney’s Hawaiian Luau Show offering all-you-care-to-eat family style dinner and a show. A new addition to the Poly, Trader Sams is a fun stop for imaginative drinks and appetizers. Just going inside is an experience for the senses as you take in the sea-faring decor. Try one of the signature drinks for a 4-d experience! An extension of the Grotto, the Tiki Terrace is a relaxing outdoor patio area serving up yummy appetizers and quenching beverages. At 8 PM, the Grotto becomes a 21+ Lounge, so families with kids can still enjoy the offerings outside, often with live music! Located on the main floor of the lobby, with access from the pool as well, Captain Cook’s is Poly’s Quick Service location offering yummy eats for breakfast, lunch and dinner and is also where you can buy your refillable drink mugs. We love the flatbreads and eat them poolside. Near the entrance to Ohana’s, Tambu Lounge is a great place to relax and enjoy an island beverage after a long day at the park or while waiting for your Ohana reservation. Try the Backscratcher or the Lapu Lapu – both Two Scoops Mom approved! Great place for a refreshing pool-side cocktail. Just outside the doors of the Main House lives the Pineapple Lanai. Home to the delicious Dole Whip frozen confection, it’s a great place to grab a quick snack on your way to watch fireworks on the beach. The Poly also offers a small market area where you can purchase cereal, bread, lunch meat, chips and snacks and, of course, wine! Moment Mom has some really great tips on the ins and outs of Disney’s Dining Plan. Here is her run down on how to make the most of those Dining Plan credits at Disney’s Polynesian Resort. Pineapple Lanai – Get your Dole Whip here! This is an excellent use of a Snack Credit! Captain Cook’s – Full menu for breakfast, lunch, and dinner. We used this for an easy quick meal before heading to the parks. Trader Sam’s Grog Grotto – The cocktails are the big draw here! Kona – You have to try the Tonga Toast! Kona serves up American food with an Asian twist. It has has a great sushi bar. ‘Ohana – ‘Ohana has a fun Best Friend Breakfast with Lilo, Stitch, Mickey, and Pluto. Lunch and Dinner are not Character meals but are one of the best meals at Disney World in my opinion! It comes with a variety of appetizers, steak, chicken, shrimp and ends with an amazing bread pudding! All of the meals are served family-style and all-you-can-eat. Disney’s Spirit of Aloha Dinner Show – Enjoy dances from Tahiti, Samoa, Tonga, New Zealand and Hawaii with an all-you can eat luau feast. There are a lot of mixed reviews about this dinner show. It is 2 Table Credits for the dining plan, so I would recommend paying out of pocket if you do decide to give it a try. Room Service – I am not usually a room service person at Walt Disney World since there are so many amazing dining options. I make an exception at Polynesian. You can order the ‘Ohana dinner in your room! It’s called the Polynesian Feast and a single adult order is enough for two people to share. This means you can enjoy the delicious food at ‘Ohana for only $40! The meal comes with appetizers, salad, bread, all three meats, juice, and even the amazing banana pudding! The Lava Pool has a zero-gravity entry which is great for the younger kids. The older kids will love the 140-foot waterslide inside a Volcano, and the adults will enjoy relaxing pool-side with concoctions from the nearby Barefoot Pool Bar. The Lava Pool also has an imaginative toddler splash pad area complete with their very own tiki treehouse. Mom Tip: The entire pool area is enclosed and accessed only by 2 security gates requiring room keys for access. The gate handles are high, making it difficult for little ones to escape unseen. With highly-qualified lifeguards on duty, go ahead and relax knowing your little ones are safe! The Poly also offers a quieter, smaller Oasis Pool, white sandy beaches and a fully-functional marina with watercraft rentals. Just a reminder, even though the sandy beaches lead you to the edge of the Seven Seas Lagoon, no Lagoon swimming is allowed for safety reasons. Fitness Center and Spa: The Poly does not offer a fitness center, but guests are encouraged to use the Fitness Center and Spa at the Grand Floridian Resort. Insider Tip: Non resort guest can get on the “Resorts Monorail” from the TTC. This is a great way to save time if the main monorail is backed up. It also gives you a chance to ride around the loop for the scenery and maybe a little “resort hopping”. For more great hacks and insider tips visit Disney Hacks here. Polynesian is the only resort with access directly to both Monorail Loops. You can either ride the Magic Kingdom Monorail over to the Transportation and Ticket Center or take a quick 10 minute walk directly. Taking the full Magic Kingdom Monorail loop took us roughly double the time. We chose to walk every time as it is much faster than waiting for the Magic Kingdom Monorail to take you all the way around. Both of our bloggers gave a raving review of Disney’s Polynesian Resort and DVC Villas. It’s not hard to understand why with the close proximity to Magic Kingdom, the amazing onsite restaurants, and the bigger than life pools and other amenities. Here are their closing remarks and why they both believe it to be one of Disney’s best Deluxe Resorts. Moment Mom and family enjoyed their stay in Disney’s Polynesian DVC Villas. Here are her final thoughts on why you should consider the Polynesian Resort and why they intend to do so again and again! TWO BATHROOMS!! It cut our “get-ready” time in half every day. It was so incredibly convenient that I’m not sure how I will go back to only one! Dining Options – I actually give Polynesian the best resort dining options for families. I have yet to find anyone who doesn’t love ‘Ohana and a Dole Whip after a day at the parks. The pool and water areas for kids are a great way to spend a non-park day. The waterslide is fun for kids and adults. Location : Being able to walk to the Ticket and Transportation Center will save around 20 minutes on your trip to Epcot compared to the other “Monorail Resorts.” Being on the monorail also means that you have quick access to Grand Floridian and Contemporary for a nice dinner or just to explore the resorts. You can go here to see all of our Disney Resort reviews. THEY DON’T CALL IT THE “GRAND” CALIFORNIAN FOR NOTHING!